I’m the mom of a theater kid which means my neighbors give me strange looks as I pull in the driveway, run in the house to change clothes, only to go back out again to another activity. I’m up at the crack of dawn on Saturdays, dragging my sleepy preteen out the door to his acting lessons. My son’s friends knock on the door, wanting to play with Casey, only for him to inform them that he’s going to voice lessons. We set off on weekends by train to go into New York City for workshops on audition techniques. After homework, he sits down to memorize his lines to the play he’s in, learns the words to the song he has to sing in an upcoming show, or practices his breathing techniques. Every car ride is filled with show tunes and singing. He analyzes songs and singers and picks out songs he might like to sing in an upcoming voice competition. He’s always VERY DRAMATIC about everything and pursues acting with a passion I have not seen him display about anything else in his 12 short years on this earth. In short, he loves to perform! 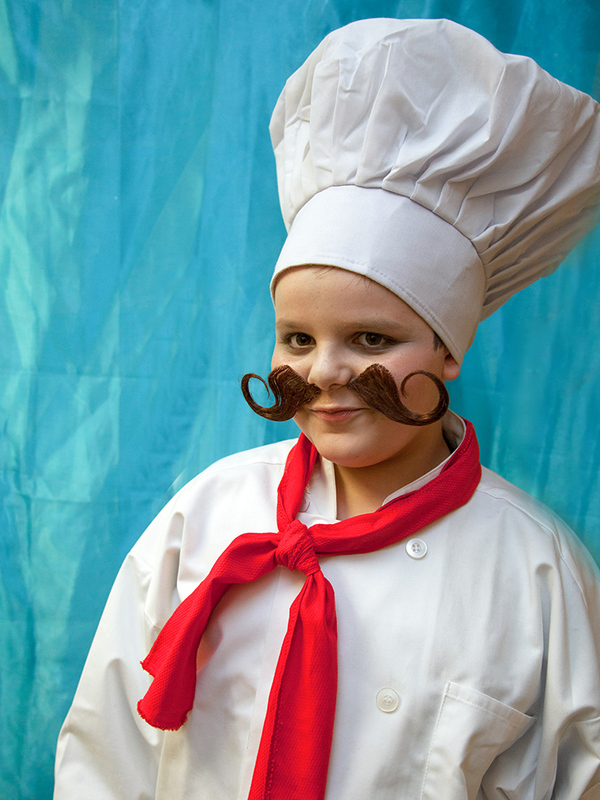 For this latest show, he was cast as Chef Louis in his middle school’s production of The Little Mermaid. In order to get this part, he had to audition at his school, which meant he had to prepare 16-32 bars of a song in the style of the show. He picked a song, marked up his music, and practiced. When he got home from the audition, he was glowing, “Mom! I got a callback. 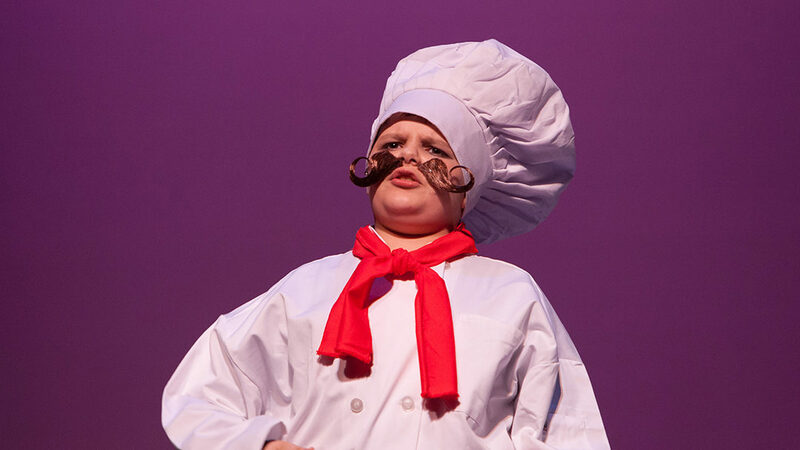 I need to memorize the Broadway version of Les Poissons by tomorrow afternoon.” After homework and dinner, this left him with about an hour and a half to memorize the song. He and I sat in front of our big screen tv in the living room playing the karaoke version of Les Poissons about 53 times. Since he needed to perform it with a French accent and had never taken French, he enlisted the help of his brother, who was in French 2 at the time. They worked together on the accent while I tried not to go completely insane from hearing the same song 53 times in a row. I did love seeing my two boys work together to accomplish a goal. He got the part and he was so excited to get his first ever solo song in a show. Over the next few months, he practiced 3 days a week after school, rehearsing for the show. 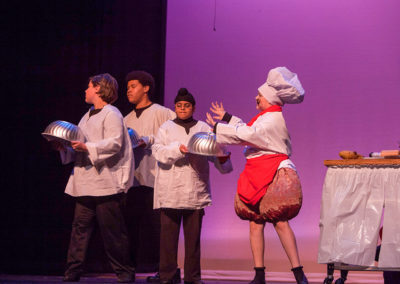 The final two weeks before the show, rehearsals were longer and were held at the Performing Arts Center. The energy of tech week was frenetic. I was lucky enough to be there to shoot behind the scenes and show footage for the parents to have after the show wrapped. Before we knew it, it was opening night. I was backstage helping the cast with their elaborate costumes. Some of them had harnesses that the costume itself strapped into and the actors needed help assembling them. Casey’s song wasn’t until the second act, after intermission. 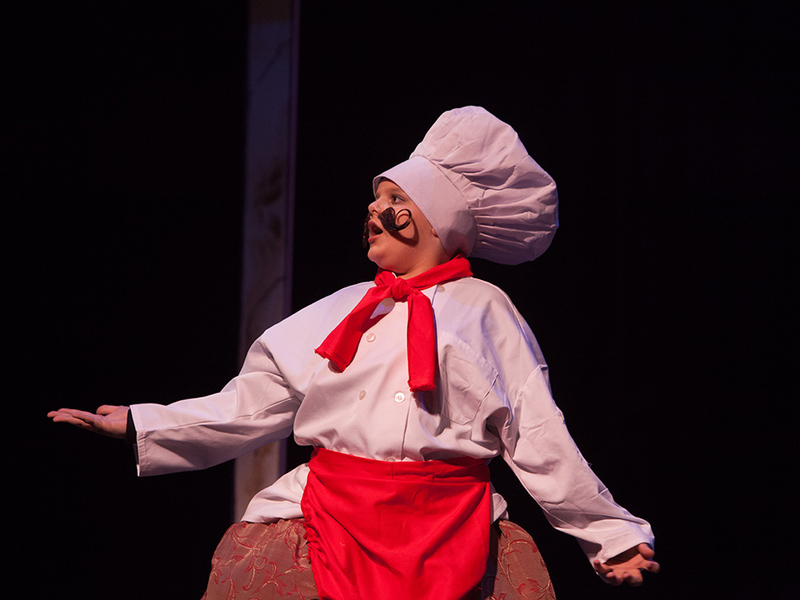 Since he was a fish for the first act, he got into his chef costume during intermission. He asked me to help him glue on his crazy handlebar mustache. I could tell how incredibly nervous he was and I was worried for him. 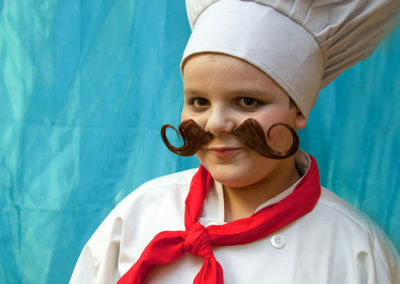 I just smiled and glued on his mustache and promised him that I’d sneak out into the audience to see his scene. I didn’t want to bother him or cramp his style right before he went on stage so I told him to break a leg and I walked away. I snuck out the side door from backstage and stood along the side of the auditorium to watch him perform. The scene right before his was a cute scene between Ariel and Eric, so the mood in the audience was sort of “Awww”. After the scene change, the lights came up and there was Casey and his sous chefs on stage, ready to go. Before he even spoke a word, the energy of the audience reacting to how he looked and how he held himself was immediate. There was a palpable feeling of excitement. 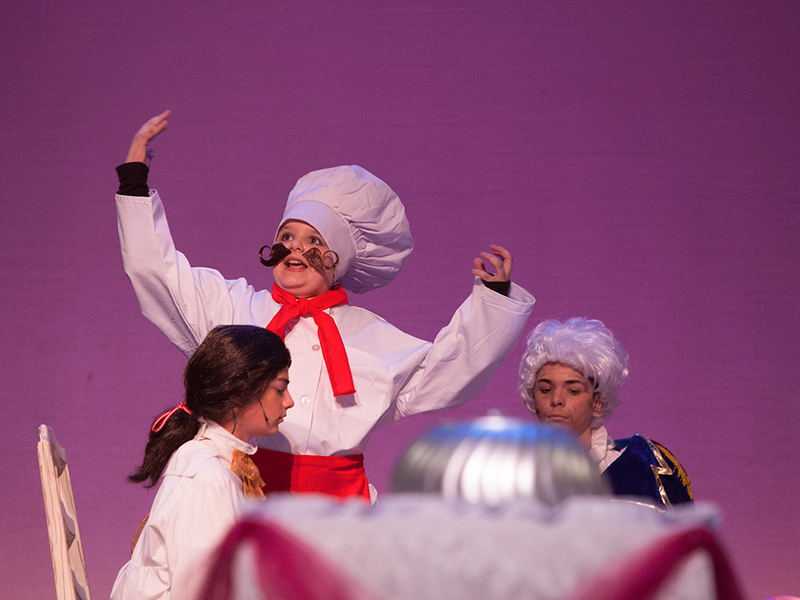 When he ordered his fellow chefs off the stage to prepare their portion of the meal and took center stage to start his song, everyone was on the edge of their seats. He started singing and just nailed his performance. I saw most of it through tear filled eyes. He knew he had the audiences undivided attention and he just ran away with it. As he ran off the stage chasing after Sebastian, everyone cheered and clapped. The next scene started with Eric, Grimbsy and Ariel at the table waiting for dinner. They are having a conversation and then they ring a bell to let the kitchen know they’d like to be served. Casey came flying back out with a gusto and the audience cheered!! They were so happy to see him again. THEY CHEERED. I was floored. As his mom, I am always happy when he comes back out on stage but for a bunch of other people, some of them who don’t know him at all, to have had that reaction was just mind blowing. I was pretty much full on crying at that point. Thank goodness I was behind a big pillar. All the hours of practice and preparation, driving him all over and having gotten very little sleep that week from helping out with the show was all worth it. Right at that moment, I was no longer annoyed by all the times I had to get him out of bed early and the times I had to bug him about what he had to do for the week. I was just so darn proud of him. When it came time for the end of the show, the finale was a big scene where Eric and Ariel get married in front of all the merpeople and the land people. Everyone was on stage except for Casey. In the last few seconds of the song, he walked on carrying a wedding cake. Would you believe it- people cheered again! I was backstage again by the time he came off the stage and the giant smile on his face was enough to fuel me through another 6 months of early mornings, late nights and endless show tunes. The end result was worth it. Here’s to hoping he has many more end results that are even more rewarding for him. I’m so grateful that I get to share this experience with him. Keep reaching for the stars, Casey!